Wise and wickedly funny, Marilyn Chin is an international treasure. Chin, born in Hong Kong and raised in Portland, Oregon, is an award-winning poet and the author of Portrait of the Self as Nation (new and selected poems, due out in 2018 from Norton), Hard Love Province, Revenge of the Mooncake Vixen, Rhapsody in Plain Yellow, The Phoenix Gone, the Terrace Empty and Dwarf Bamboo. Her writing has appeared in The Norton Anthology of Modern and Contemporary Poetry. Her books have become Asian American classics and are taught in classrooms internationally. 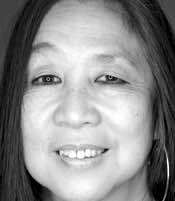 Marilyn Chin has read her poetry at the Library of Congress. She was interviewed by Bill Moyers and featured in his PBS series The Language of Life and in PBS’s Poetry Everywhere. Chin has read her poems and taught workshops all over the world. Recently, she taught at the Iowa Writers’ Workshop and was guest poet at universities in Beijing, Singapore, Hong Kong, Manchester, Sydney, and Berlin. In addition to writing poetry and fiction, she has translated poems by the modern Chinese poet Ai Qing and by the Japanese poet Gozo Yoshimasu. Recently, she was a Distinguished Visiting Professor at Beijing Foreign Studies University. In addition to teaching in the MFA program at San Diego State University, she also serves as mentor on the international faculty of The City University of Hong Kong’s low residency MFA program, the first of such programs in Asia. She has recently been appointed a Chancellor of the Academy of American Poets. I am Marilyn Mei Ling Chin. by which all earthly men were measured. One has a squarish head and a nose without a bridge. survived by everybody and forgotten by all. or China back her early ideological splendor, I would. and retrieve the wisdom charred by the pyres of Qin. their sadness on the unyielding earth. of the pure yellow seed would not enter. each poem I write conjures the dead washing women of Loyang. I believe in eternal spring. against the soft silhouettes of my people. fades like a cruel sun. where the emotions come from. But the rest is fading. (and no help from the phoneticist). A heathen poi dog, a creamy half-and-half? Chaos said, “O, Mei Ling, give me eyes so that I can admire your beauty.” So, Mei Ling punctured two wounds into his forehead. And as he gazed longingly into her eyes, Chaos said, “O, beautiful one, I can’t smell your sweet scent.” So, Mei Ling cut two holes for his nostrils. Chaos said, “O, melodious poet, give me two ears, so that I can hear your fine poems.” Again, Mei Ling obliged. Chaos said, “At last, give me a sweet mouth, so that when we kiss my tongue could interlock with your tongue, deep into all eternity.” And so, Mei Ling cut for him a deep red mouth and kissed it. Chaos said, “I have loved you too much” and bled from his seven sockets into turbulent rivers of blood, spilling over the dark continents, flooding the deforested plains and pestilential cities, destroying the once abundant borderlands. Finally, Chaos marveled at his own gruesome handiwork and would want for nothing. These poems are drawn from Portrait of the Self as Nation, New and Selected Poems, and used by gracious permission of W. W. Norton. View More: Next piece "Short Takes: My Bag", Home, Archive. Marilyn’s new book is due to arrive tomorrow! A perfect birthday present. Perfect, indeed. Happy birthday to any and all. Wonderful memory poems that capture the old world in the new. Vivid images of food and aprons, of love and loneliness, all ever present in the immigrant. Well done. I enjoyed the read. Thank you. oops the other Marilyn I mean here is Marilyn Hacker, Empress of Formalist Acrobatics and Passion.